It’s a common practice to use Ajax, Silverlight or Flash to communicate with the server on the same domain. However, at times, you are required to access another domain, and this may be interpreted by browsers as a security issue. 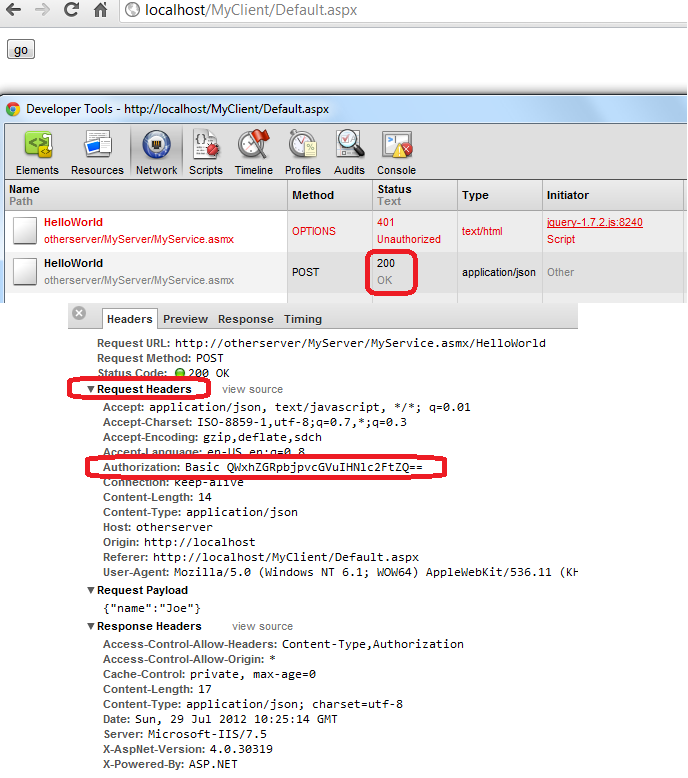 This post specifically addresses how to do so using CORS: “Cross-origin resource sharing”. You might say that the purpose of CORS is to help browsers understand that accessing a resource from a different domain is legit. Consider this example: There are web services available from a certain other domain. You wish to access them from a browser using Ajax, but the browser interprets this a security issue and forbids it. CORS is the now-standard way to perform some sort of a handshake between the browser and the server before the Web Services can be consumed. The browser queries the server whether it’s OK to access a Web Service and acts according to the reply. Note, that although the server is what needs to be configured to allow access to your client, it is the browser that performs the limitation and will stop the request if no such access was granted. A different client such as a .NET application need not worry about CORS, unless for some reason the developer is required to support it, as the server does not enforce clients to use CORS. 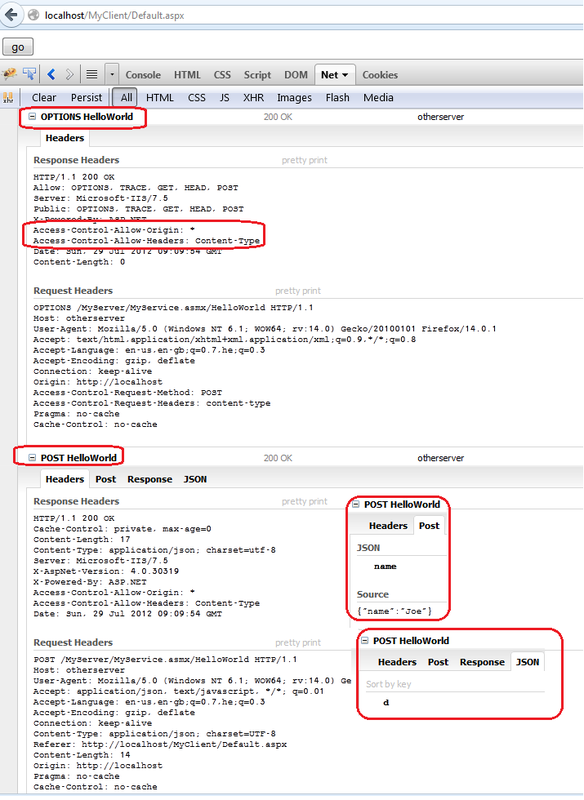 Supporting CORS on the server side is merely done by sending several Response Headers to the client browser. On IIS this is done either by adding headers to the outgoing responses or by tweaking web.config as required. 1 Web Service which needs to be consumed. 1 IIS to host that Web Service on a domain other than the client browser domain. 1 IIS to host a client script trying to consume that Web Service. 1 Firefox browser (tested version is 14.0.1) and 1 Chrome browser (tested version is 20). 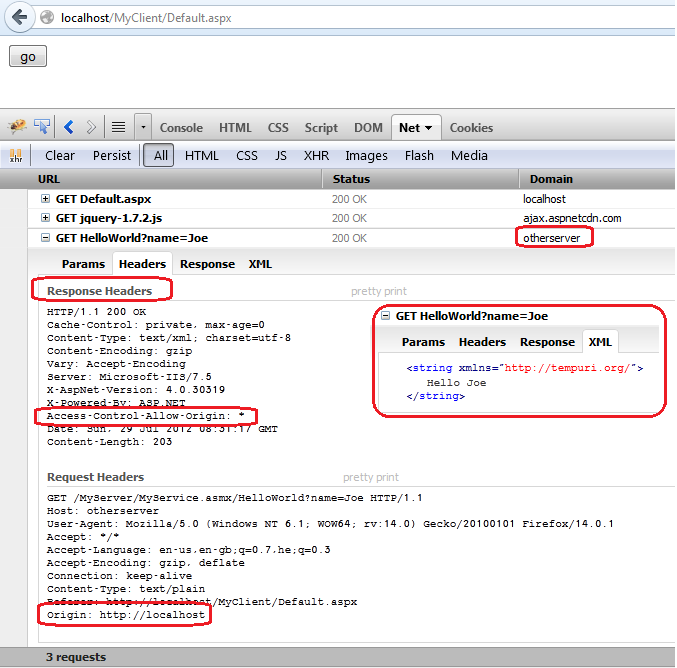 Note that the client code does not send nor expect a JSON type. this is deliberate and will be explained later on why. Running the above client results in somewhat conflicting results on Firefox and Chrome. 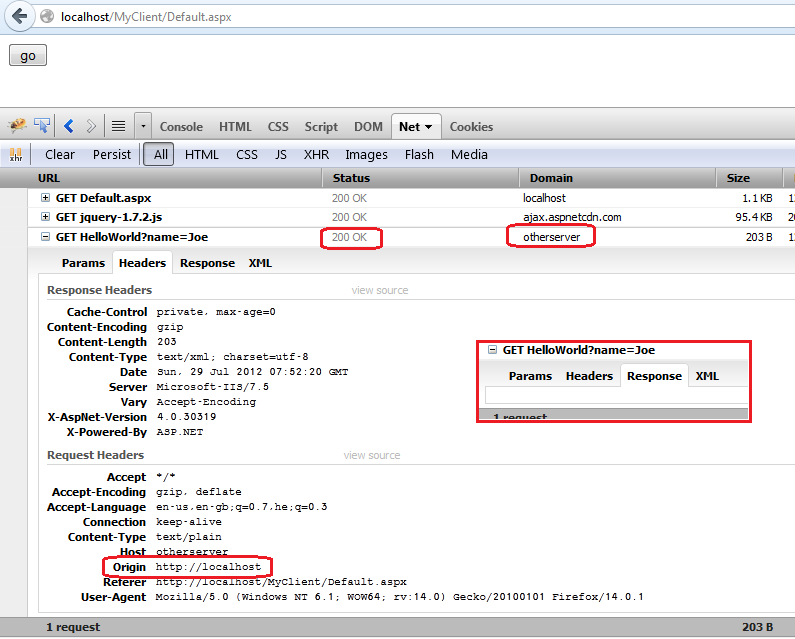 In FF, exploring Firebug Net tab shows as if the request and response went as expected. As you can see in the screenshot below, the request was sent from localhost to ‘otherserver’, and returned with a 200 (OK). But, as you can also see the response text is empty. Server side debugging proves that the request arrived as expected. 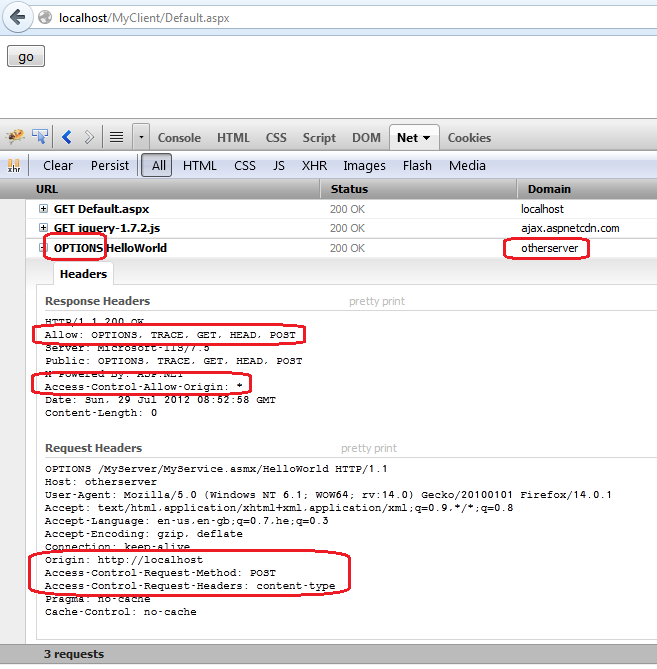 However client side debugging shows a somewhat different picture as the status of the request returns as 0 and not 200. In Chrome, the Network tab shows an almost immediate error and sets the status of the request to ‘(canceled’). When reverting to a more “native” use of XMLHttpRequest rather then jQuery, it seems like the status of the request is also returned as 0 instead of 200. 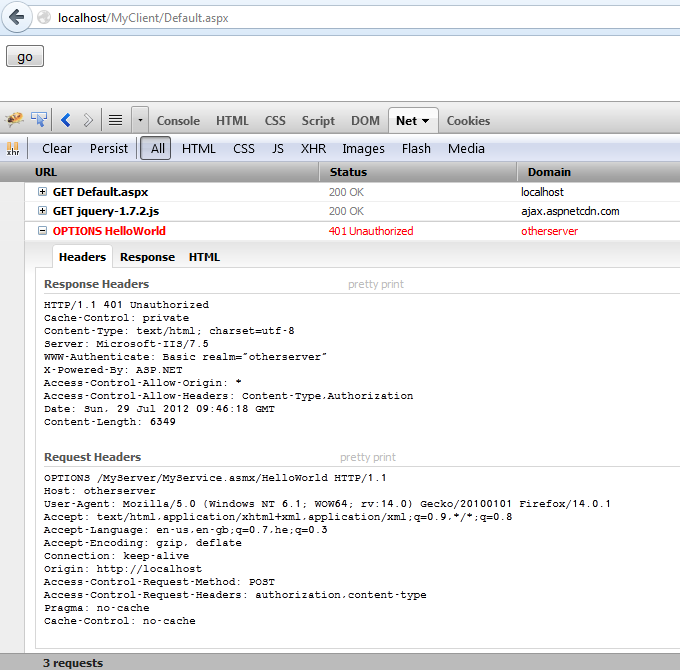 BTW: running this exact client script from within ‘otherserver’ domain will work OK, with the expected xml returned. In order to make this work, the server has to send back the “Access-Control-Allow-Origin” response header, acknowledging the client. The value of this response header can be either ‘*’ or an actual expected client domain, thus allowing a more controlled CORS interaction, if required. You may have noticed in the previous screenshot that the browser automatically sends an ‘Origin’ header when the request is a cross-site request. That is the name of the domain that the server should return so that the request will be allowed. Note: If you do decide to specify an explicit origin, you must provide the origin as it is sent in the request headers. In this example it is ‘http://localhost&#8217;, but naturally this has to be the actual domain name a consuming script is running from. The browser sends an OPTIONS request. The browser sends two new request headers: “Access-Control-Request-Method” with a value of “POST”, and “Access-Control-Request-Headers” with a value of “content-type”. This quite clearly states that the browser is asking whether it can use POST and whether it can send a “content-type” header in the request. The server replies that “POST” is indeed allowed (amongst other methods), and maintains the origin as ‘*’ like before. The server doesn’t tell the browser anything about the content-type header request, which is the problem here. In this case the browser was not satisfied with the preflight response from the server and therefore the original request was not sent. It uses methods other than GET or POST. Also, if POST is used to send request data with a Content-Type other than application/x-www-form-urlencoded, multipart/form-data, or text/plain, e.g. if the POST request sends an XML payload to the server using application/xml or text/xml, then the request is preflighted. So by sending a content-type of ‘application/json’, we have made this request perform a “preflight” request. If the server resource is secured and requires authentication for accessing it before a client can actually consume it, you’ll have to modify your request accordingly, or you’ll end-up with a 401 authorization response from the server. For example, if you protect your Web Service with Basic Authentication (and disable Anonymous Authentication, of course), then you have to have your request conform to the Basic Authentication requirements, which means that you have to add a request header of “Authorization” with a value that begins with “Basic” followed by a Base64 string of a combined username:password string (which is by no way encrypted – but that is another matter). So borrowing Wikipedia’s sample, if we have an “Aladdin” user account with a password of “open sesame”, we have to convert to Base64 the string of “Aladdin:open sesame” and add it as an Authorization request header. The request header should be: “Authorization: Basic QWxhZGRpbjpvcGVuIHNlc2FtZQ==”. UPDATE: Wikipedia’s relevant page was modified till this post was published their excellent Aladdin sample was somewhat changed. I added withCredentials to the request (if you use this you have to have your server return a Access-Control-Allow-Credentials: true, and have Access-Control-Allow-Origin return an explicit origin). I added username/password to the request. I added the patch designated to fix the known FF bug of getAllResponseHeaders() not returning the response headers correctly. Also added the “Access-Control-Allow-Credentials” to the server response. Changed the “Access-Control-Allow-Origin” from “*” to the “http://localhost&#8221; (request origin) as the FF docs specify. I also reverted from jQuery to the “native” XMLHttpRequest to no avail. Nothing I tried made it work on FF. Here comes the bad part. While for Integrated Application Pools, you can code a custom module to bypass IIS behavior and return a 200 for the preflight, you cannot do that for a Classic Application Pool. In an Integrated Application Pool, ASP.NET is integrated into IIS’ pipeline, allowing you to customize the authentication mechanism in this particular case. However a Classic Application Pool means that module code will run only after IIS has authorized the request (or rather – failed to authorize in this case). The code above is very non-restrictive – it allows all preflights (or other usage of the OPTIONS verb) to get away without authentication. So you better consider revising it to your needs. Line 1 shows that this code runs upon a request authentication. Line 4 queries whether there’s an Authorization header. Lines 7-8 proceed to authentication only for Basic Authentication (you can customize this to your needs). This particular example demonstrates Basic Authentication. Lines 16-21 demonstrate different methods of authentication. You have to choose what’s best for you or add your own. Line 23-26 are optional and can be used to populate the current context’s User property with an identity that you might need in your Web Service later on. Lines 30-35 return a 401 and a WWW-Authenticate header which indicate to the client which authentication methods are allowed (that is, in case the user was not authenticated). This solution is a variant of the solution described in a previous post I made about having a “Mixed Authentication” for a website. I really can’t tell, but it seems like CORS is something that is here to stay. Unlike JSONP which is a workaround that utilizes a security hole in todays browsers, one that might be dealt with someday, CORS is an attempt to formalize a more secure way to protect the browsing user. The thing is that CORS is not trivial as I would have preferred it to be. True, once you get the hang of it, it makes sense. But it has it’s limitations and complexity to get it right without spending too much time to configure it correctly. As for the IIS Classic App Pool and non-anonymous configuration issue, well, that is something that seems to be like a real problem. You can try to follow this thread and see if something comes up. Lame, but this post’s title is credited to The Corrs.